The Sunday bird walk went to Buttertubs Marsh in Nanaimo. The morning was sprinkling with light showers and sunny periods. 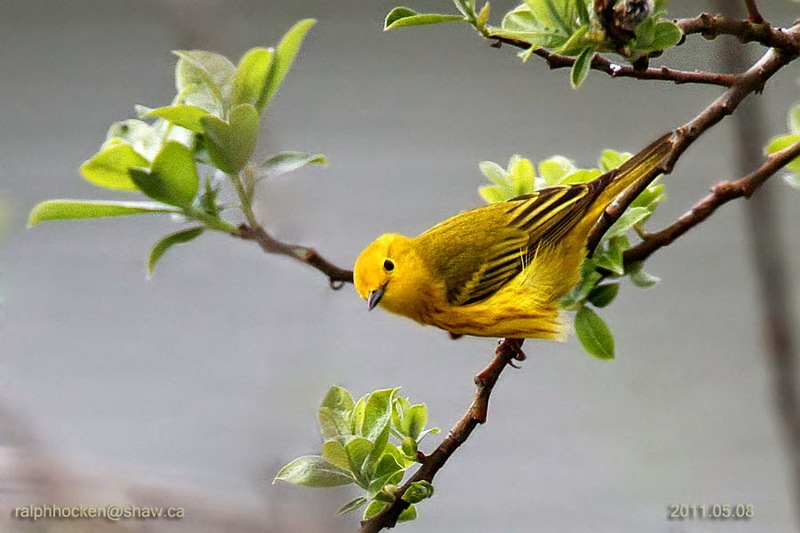 The bird of the morning was the Yellow Warbler which we saw and heard throughout the morning. A flock of Bushtits were feeding near the trail giving us good close views. Red-tailed Hawk, Belted Kingfisher, Rufous Hummingbird, Northern Flicker, Northwestern Crow, Black Swift, Purple Martin, Tree Swallow, Violet-green Swallow, Northern Rough-winged Swallow, Willow Flycatcher, Pacific-sloped Flycatcher, Chestnut-backed Chickadee, Red-breasted Nuthatch, Bushtit, Marsh Wren, Bewick's Wren, Black-headed Grosbeak, Eurasian Collared Dove, American Robin, Swainson’s Thrush, European Starling, Cedar Waxwing, Warbling Vireo, Yellow Warbler, Wilson’s Warbler, Common Yellowthroat, Spotted Towhee, Song Sparrow, Brown-headed Cowbird, Brewer’s Blackbird, Red-winged Blackbird, House Finch and House Sparrow. Seven Vaux's and Black Swifts were seen high over Meridian Way in Parksville. 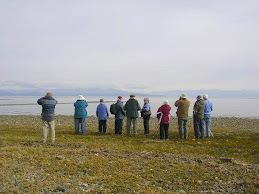 Tuesday's bird walk went to Lot 10 in Qualicum Beach. The morning started out with heavy drizzle, but began to clear by the time we reached the river. There seemed to be a multitude of American Robins on this walk. We were treated with the sighting of a Great Horned Owl not far in on a side trail, and also watched a Rough-winged Swallow flying out over the river. One Purple Martin was spotted high above the trees. We were also lucky enough to watch a Hermit Thrush feeding on the rocks along the river edge. 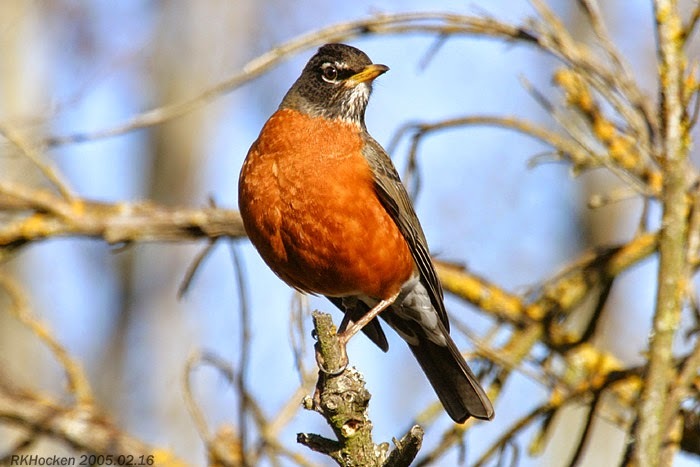 American Robin: Ralph Hocken Photo. A special thanks to Rhonda, Paul and John for leading the Tuesday bird walk. 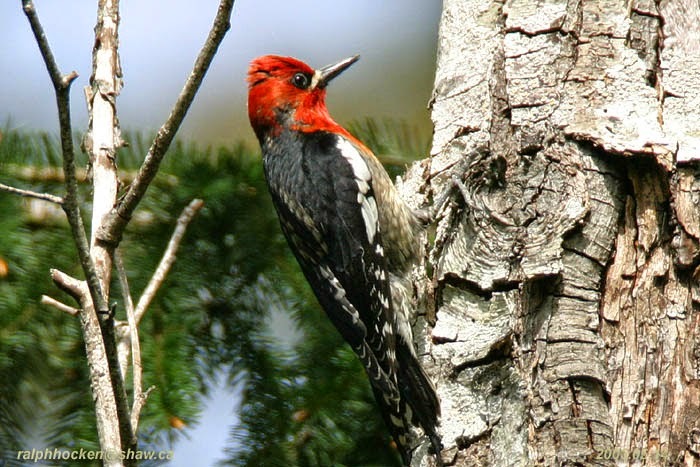 The Tuesday bird walk on July 01, 2014 will be going to Springwood Park in Parksville. Meet at Parksville Bay Community Park at the parking lot near the Lion’s Playground at 9:00 a.m. or at the west end of Despard Avenue at about 9:15 a.m.. The Sunday bird walk on July 06, 2014 will be going to Hemer Park in Cedar. Meet at the Bird Store at 9:00 a.m. or the parking lot at Hemer Park. Follow Cedar Road to Hemer Road (look for the Hemer sign) at about 9:30 a.m. 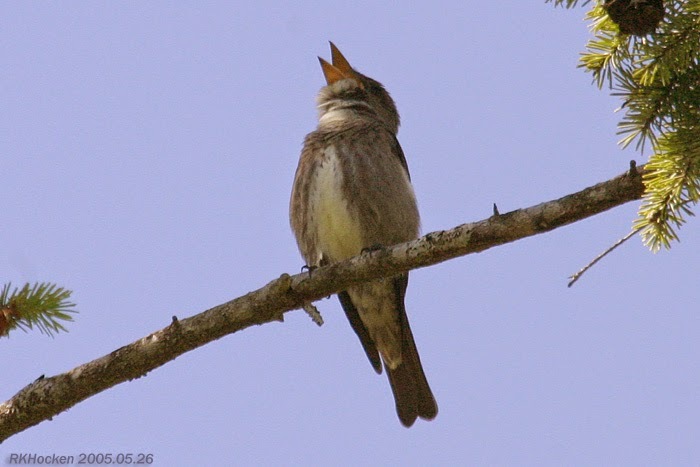 The Tuesday bird walk on July 01 will be going to Springwood Park in Parksville. The Sunday bird walk went to Legacy Marsh in upper Lantzville. The morning started of overcast but the weather cleared to a beautiful sunny day. Red-breasted Sapsuckers and Willow Flycatchers seem to be a common sight today. Pied-billed Grebe, Mallard, Hooded Merganser, Bald Eagle, Turkey Vulture, Sharp-shinned Hawk, California Quail, Virginia Rail, Band-tailed Pigeon, Rufous Hummingbird, Northern Flicker, Downy Woodpecker, Red-breasted Sapsucker, Pacific-slope Flycatcher, Willow Flycatcher, Olive-sided Flycatcher, Warbling Vireo, Hutton’s Vireo, Common Raven, Northwestern Crow, Violet-green Swallow, Barn Swallow, Purple Martin, Chestnut-backed Chickadee, Red-breasted Nuthatch, Brown Creeper, Marsh Wren, Pacific Wren, Swainson’s Thrush, American Robin, Cedar Waxwing, Townsend’s Warbler, MacGillivray’s Warbler, Yellow Warbler, Orange-crowned Warbler, Black-throated Gray Warbler, Wilson’s Warbler, Common Yellowthroat, Western Tanager, Black-headed Grosbeak, Red-winged Blackbird, Brown-headed Cowbird, Spotted Towhee, White-crowned Sparrow, Song Sparrow, Song Sparrow, Dark-eyed Junco, Purple Finch, American Goldfinch. Red-breasted Sapsucker, photo by Ralph Hocken. American Dipper was seen and videoed in a backyard on Lynburn crescent Nanaimo, near Departure Bay. 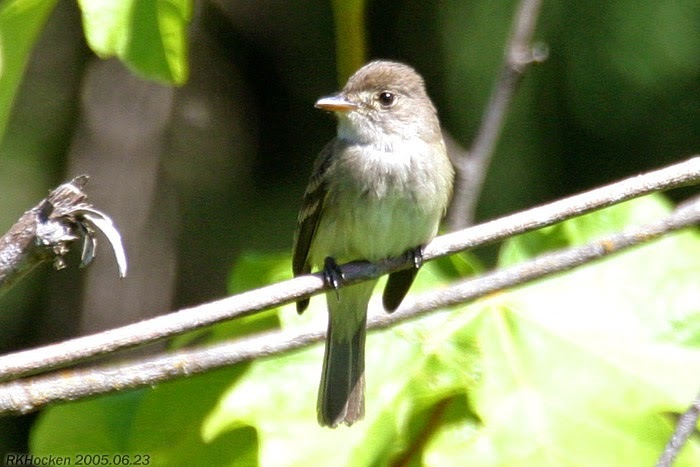 Olive-sided Flycatcher was heard calling in a snag above Colburne drive, Nanaimo. Black-headed Grosbeak, photo by Ralph Hocken. The Tuesday bird walk went to the Beaver Ponds in Nanoose Bay. The morning was sunny and warm. 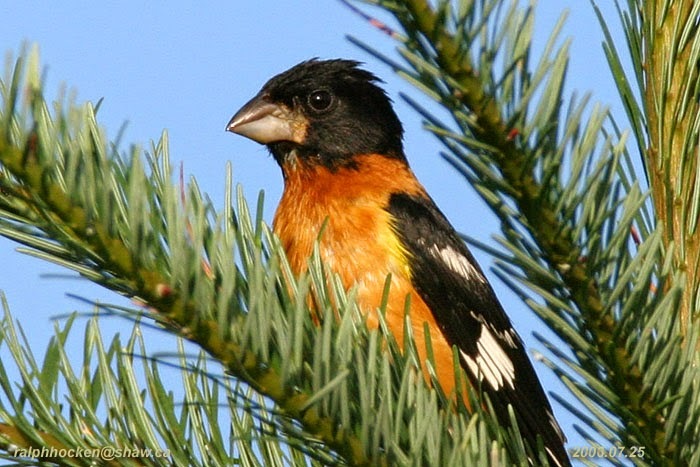 We were greeted with the sighting and sounds of a pair of Black-headed Grosbeaks on the trees just above us at the start of the walk. A Hooded Merganser was resting on a log with young chicks on the Beaver Pond. We watched as a Red-tailed Hawk, six Bald Eagles and a Turkey Vulture caught a thermo high above us. 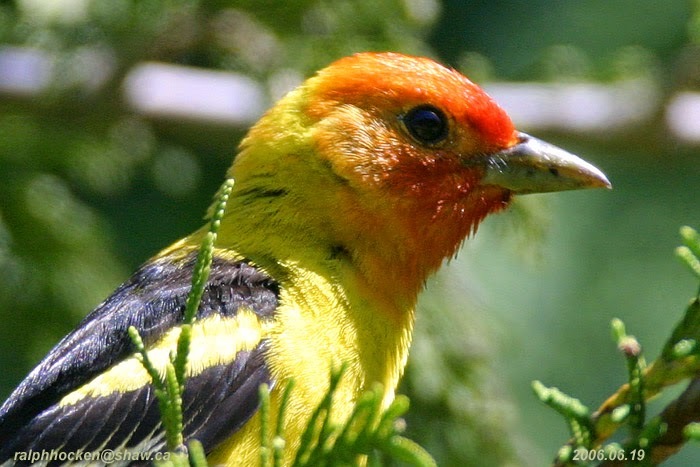 A pair of Western Tanager’s entertained us as they fed in a tall cedar tree near the trail. Swainson's Thrush , American Robin, European Starling, Orange-crowned Warbler , Black-throated Gray Warbler, Townsend’s Warbler, Western Tanager , Spotted Towhee , Chipping Sparrow, Song Sparrow, Dark-eyed Junco, Red-winged Blackbird, Black-headed Grosbeak, Purple Finch, House Finch, American Goldfinch. The Tuesday bird walk on June 24, 2014 will be going to Lot Ten in Qualicum Beach. Meet at Parksville Bay Community Park at the parking lot near the Lion’s Playground or on Kinkade Road on the mountain side of highway 19a in north Qualicum Beach. The Sunday bird walk on June 29, 2014 will be going to Buttertubs Marsh. Meet at the Bird Store at 9:00 a.m. or the parking lot at the end of Buttertubs drive off Bowen road about 9:15 a.m.
Black-headed Grosbeak: Ralph Hocken Photo. American Kestrel chicks: John Purves Photo. The Sunday bird walk went to Beck Creek in south Nanaimo. The morning was cloudy with rain showers. A Hooded Merganser was seen on the pond with a fledgling on its back. We had great views of six Barn Swallows flying at eye level right next to us at the point of Beck Creek. Purple Martins flew by and sang as they flew. A Warbling Vireo and a Black-headed Grosbeak were singing during the morning. Canada Goose, Mallard, Pied-billed Grebe, Common Merganser, Hooded Merganser, Great Blue Heron, Turkey Vulture, Bald Eagle, Glaucous-winged Gull, Band-tailed Pigeon, Eurasian Collared Dove, Belted Kingfisher, Rufous Hummingbird, Pacific-sloped Flycatcher, Willow Flycatcher, Orange-crowned Warbler, Yellow Warbler, Warbling Vireo, Downy Woodpecker, Northern Flicker, Northwestern Crow, Common Raven, Purple Martin, Tree Swallow, Violet-green Swallow, Barn Swallow, Northern Rough-winged Swallow, Chestnut-backed Chickadee, Red-breasted Nuthatch, Brown Creeper, Pacific Wren, Marsh Wren, Golden-crowned Kinglet, European Starling, Swainson's Thrush, American Robin, Cedar Waxwing, Black Headed Grosbeak, Spotted Towhee, Song Sparrow, White-crowned Sparrow, Red-winged Blackbird, Brown-headed Cowbird and Dark-eyed Junco. The Tuesday bird walk went to the Top Bridge Trail in Parksville. The morning was cloudy with sunny periods. Six Caspian Terns greeted us at Parksville Beach before the start of the walk. 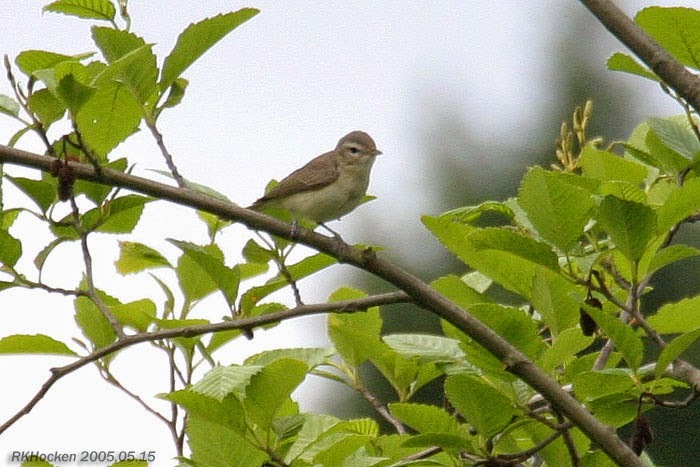 We heard and saw several Willow Flycatchers both at the beginning of the walk and at the end. We heard a Black-headed Grosbeak, Common Yellowthroats, Pacific-slope Flycatchers, Warbling Vireos, and Cassin’s Vireo during the morning making for a morning of birding by ear—a common thing at this time of the year. We spotted an Olive-sided Flycatcher singing at the top of a bush. The bird of the morning however, was hearing and then finally seeing the elusive Red-eyed Vireo singing continually as he perched in a tree high above the trail. Turkey Vulture, Bald Eagle, Red-tailed Hawk, Rufous Hummingbird, Northern Flicker, Northwestern Crow, Common Raven, Violet-green Swallow, Tree Swallow, Chestnut-backed Chickadee, Red-breasted Nuthatch, Bewick's Wren, American Robin, Swainson's Thrush, European Starling, Rock Pigeon, Band-tailed Pigeon, California Quail, Orange-crowned Warbler, Yellow Warbler, Wilson’s Warbler, Black-throated Gray Warbler, MacGillivray’s Warbler, Common Yellowthroat, Willow Flycatcher, Pacific-slope Flycatcher,Olive-sided Flycatcher, Warbling Vireo, Cassin’s Vireo, Red-eyed Vireo, Brown Creeper, Spotted Towhee, Chipping Sparrow, Song Sparrow, White-crowned Sparrow, Dark-eyed Junco, Brown-headed Cowbird, Purple Finch, American Goldfinch and Black-headed Grosbeak. An American Kestrel was spotted on a hydro line along Peterson Road in Rivers Edge subdivision in Parksville. The Tuesday bird walk on June 17, 2014 will be going to the Beaver Ponds in Nanoose Bay. Meet at the Parksville Community Park in Parksville at the parking lot near the Lions Club playground at 9:00 am. Or at parking area on Powder Point Road, about 100 yards past the four way stop sign at Anchor (where Powder Point Road becomes Fairwinds Drive.) in Nanoose Bay. The Sunday bird walk on June 22, 2014 will be going to Legacy Marsh in upper Lantzville. Meet at the Bird Store at 9:00 a.m. or under the hydro lines along Normarel Drive at about 9:20 a.m. The Tuesday bird walk went to the Top Bridge Trail in Parksville. The morning was cloudy with sunny periods. Six Caspian Terns greeted us at Parksville Beach before the start of the walk. 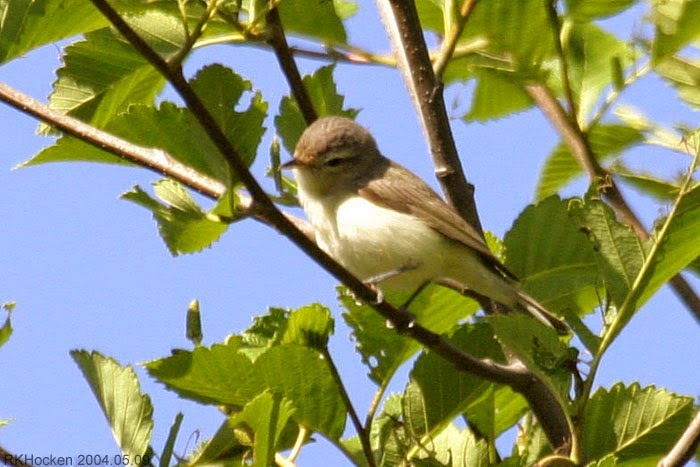 We heard and saw several Willow Flycatchers both at the beginning of the walk and at the end. We heard Common Yellowthroats, Pacific-slope Flycatchers, Black-headed Grosbeak, Warbling Vireos, and Cassin’s Vireo during the morning making for a morning of birding by ear—a common thing at this time of the year. We spotted an Olive-sided Flycatcher singing at the top of a bush. The bird of the morning however, was hearing and then finally seeing the elusive Red-eyed Vireo singing continually as he perched in a tree high above the trail. Red-eyed Vireo at nest: internet Photo. 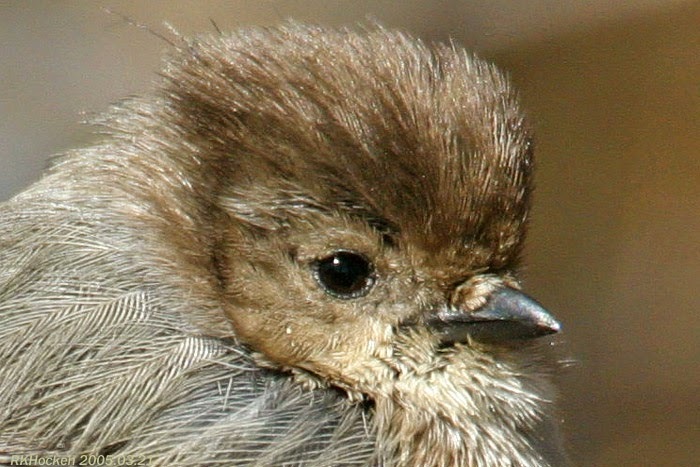 Olive-sided Flycatcher: Ralph Hocken Photo. The Sunday bird walk went to Moorecroft Regional Park in Nanoose Bay. The morning was sunny and warm and a little cool in the forest. Several Red-breasted Nuthatch’s were at the start of the walk feeding on the suet. We had great views of a MacGillivray’s Warbler singing on a snag near the trail. 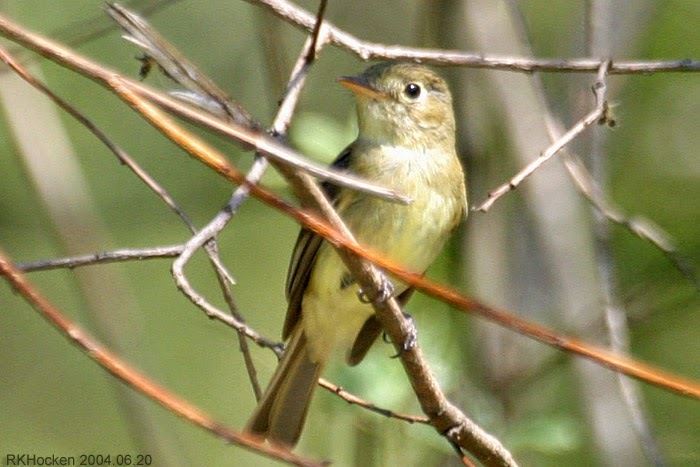 A Pacific-slope Flycatcher flew in and perched near the beaver pond. A Townsend’s Warbler flew in and sang near the trail giving us awesome close up views. Canada Geese, Turkey Vulture, Bald Eagle, Glaucous-winged Gull, Pelagic Cormorant, Rufous Hummingbird, Northern Flicker, Olive-sided Flycatcher, Pacific-slope Flycatcher, Orange-crowned Warbler, Townsend’s Warbler, Yellow-rumped Warbler, Black-throated Gray Warbler, MacGillivray’s Warbler, Wilson’s Warbler, Common Yellowthroat, Northwestern Crow, Common Raven, Purple Martin, Violet-green Swallow, Brown Creeper, Chestnut-backed Chickadee, Red-breasted Nuthatch, Pacific Wren, Swainson’s Thrush, American Robin, European Starling, Western Tanager, Spotted Towhee, Song Sparrow, Dark-eyed Junco, Purple Finch and American Goldfinch. The Tuesday bird walk went to Moorecroft Regional Park in Nanoose Bay. The morning was sunny and warm making for a good morning of birding along the Strait of Georgia and in the cooler forest trails. Fourteen seals were guarding the entrance to the bay. Two Warbling Vireos were spotted high up in a tall conifer feeding along the branches giving us great views. We saw Brown Creepers feeding their young just off the trail. We watched as a pair of Chestnut-backed Chickadees took food to their fledglings in a nest hole in a tall snag. A MacGillivray’s Warbler was seen perched in a conifer singing continually near the beaver ponds, just off the trail, giving us awesome views. A Pacific-slope Flycatcher flew into the same area again giving us great views. Pacific Loon, Turkey Vulture, Bald Eagle, Copper’s Hawk, Glaucous-winged Gull, Pigeon Guillemot, Anna's Hummingbird, Rufous Hummingbird, Hairy Woodpecker, Northern Flicker, Pacific-slope Flycatcher, Hammond’s Flycatcher, Orange-crowned Warbler, Yellow-rumped Warbler, Black-throated Gray Warbler, MacGillivray’s Warbler, Wilson’s Warbler, Warbling Vireo, Northwestern Crow, Common Raven, Violet-green Swallow, Brown Creeper, Chestnut-backed Chickadee, Red-breasted Nuthatch, Pacific Wren, Swainson’s Thrush, American Robin, European Starling, Western Tanager, Spotted Towhee, Song Sparrow and Dark-eyed Junco. Twenty-two Caspian Terns were seen at the mouth of the Englishman River in Parksville. A Bullock’s Oriole was spotted visiting a backyard feeder along Rutherford Ridge in Nanaimo. The Tuesday bird walk on June 10, 2014 will be going to the Top bridge Trail in Parksville. Meet at the Parksville Community Park in Parksville at the parking lot near the Lions Club playground at 9:00 am. or at the parking lot off Enterprise Way near Tuan Road in Parksville at about 9:10 a.m. The Sunday bird walk on June 15, 2014 will be going to Beck Creek in south Nanaimo. 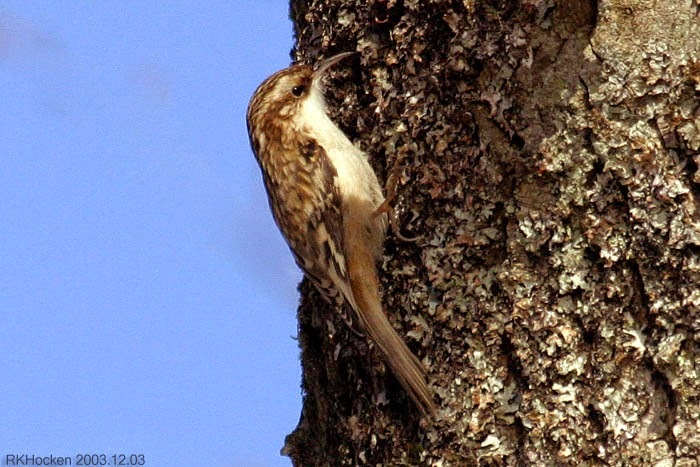 Meet at the Bird Store at 9:00 a.m. or at the parking area in front of the Living Forest Campground on Maki Road off highway one at about 9:30 a.m.
Brown Creeper: Ralph Hocken Photo. The Tuesday bird walk on June 10, 2014 will be going to the Top Bridge Trail off Enterprise Way in Parksville.